.....Perpetual motion can change our perception of the Universe from a conservative system to a creative system. Perpetual motion has enough strength to force us to reconsider our ideas about energy and origin of the Universe. Our effort to understand the cosmos can be very well facilitated by construction of a gravity perpetual motion machine, and many other types of perpetual motion machine that waits to be invented in near future. We must first direct our energies to design various other perpetual motion machines based on the force other than gravity. Implications of perpetual motion machines may then unfold in a variety of ways, which may one day render our present knowledge of the cosmos as obsolete as those of medieval philosopher who speculated cosmos as a machine set in motion and allowed to run down like the spring of the watch. In the light of energy creation principle, there is urgent need to identify various energy release mechanisms in domains of particle physics and cosmology. Perpetual motion easily explains our physical world --- No special creations; No ad hoc laws to avoid paradoxes; No bias; No unnatural blueprints; No illogical happenings. Physicists should be happy that all fundamental necessities in perpetual motion already exist. 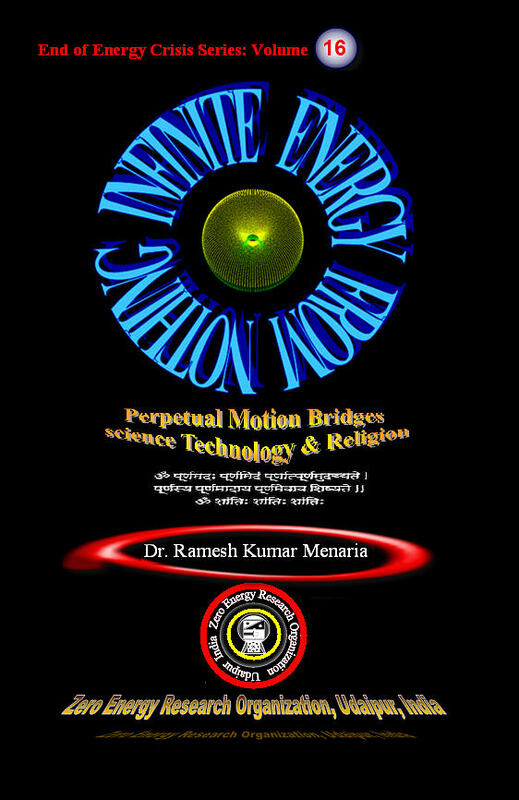 I am sure present volume “Energy from Nothing” in light of perpetual motion would inspire you to settle your own philosophy of energy and perpetual motion. You may have already done some philosophical thinking on this subject. Author does not claim that his philosophy of energy regarding ultimate nature and behavior of energy is perfect. It may not have details of a good theory, however, a “touch and go” feeling to reader is enough to initiate an enquiry. It is just an effort to take the reader to the nature of energy in an informal manner, in the light of working of the perpetual motion machine. It is therefore, hoped that that they will take it in an informal, easy, and playful manner, author’s sole purpose is to awaken their interest and curiosity and show some glimpses of truth about nature of energy- everything through investigations into Over-balancing wheel. …. 2 Where Does Created Energy Come From?